If you’re at all like us, you find the exploration of how cannabis works within the human body incredibly fascinating. Within the last few decades, intense research has revealed some of the mysteries behind why the cannabis plant creates a variety of medicinal and psychoactive effects on the human body. Most of the findings are either too recent or considered too controversial (thanks to negative associations with cannabis), and haven’t even been added to school textbooks or even most medical school courses. That’s where cannabis educators come in, so settle in and get ready to learn—no highlighting or note taking necessary. Before we dive into the cannabinoid receptors themselves, we need to first explore the endocannabinoid system. Discovered in the 1990s by scientists studying the effects of cannabis on the body and named after the cannabis plant, the endocannabinoid system (ECS) is a type of communications system within the brain and body. Comprised of a collection of specialized lipids, their cannabinoid receptors, and enzymes that help maintain basic actions and respond to illness, the ECS affects a variety of functions, including metabolism, circulation, energy and organ function. Some scientists even believe that the ECS helps balance and regulate proper homeostasis, which is the body’s ability to maintain the best possible conditions and proper calibration of every system that keeps you running. Through various duties, the endocannabinoid system is thought to affect and play an important role in a plethora of physiological symptoms including pain, appetite, memory, mood, inflammation, sleep health, stress levels, anxiety, digestion and more. Although they’ve only recently been discovered, cannabinoid receptors play a vital role in the human body. When activated by cannabinoids (i.e. THC, CBD, etc. ), the cannabinoid receptors are thought to actually alter how the body regulates. To date, only two types of cannabinoid receptors have been identified: CB1 receptors and CB2 receptors. Each of them uphold very different responsibilities within the human body. CB1 receptors are generally found on nerve cells in the brain and spinal cord, which is how cannabinoids create effects dealing with memory and pain. However, they have also been located in organs and tissues such as the spleen, white blood cells, endocrine gland and parts of the reproductive, gastrointestinal and urinary tracts. In addition to their pain and memory effects, CB1 receptors are also thought to affect sleep and appetite. These receptors in the brain are also responsible for the psychoactive effect of cannabis. In comparison to the CB1 receptors, CB2 receptors are mostly located throughout the body’s immune system and related organs (such as the tonsils and thymus gland). CB2 receptors have been found within the brain, though in a much smaller density than their CB1 counterparts. Our own body’s fixer uppers, CB2 receptors have been found to help reduce inflammation and repair tissue damage. They don’t create the psychoactive effects within the human body that CB1 receptors do, so CB2 receptors are becoming increasingly popular subjects for medical research. Of course, as humans we’re all snowflakes—each of us is uniquely different. In this way, our bodies may contain fewer or more cannabinoid receptors than others, or we may be more or less sensitive to their effects. Some patients have been known to overexpress CB1, making them highly sensitive to particularl cannabinoids such as THC. Others may have underexpressed cannabinoid receptors, making that individual less sensitive to the effects. A study published in the British Journal of Pharmacology also showed evidence that cannabinoid receptors have been found in varying densities within various parts of the body, including the brain, central nervous system and immune system. This means it’s not just the number of cannabinoid receptors that can vary from person to person, but even where they cluster in our bodies. 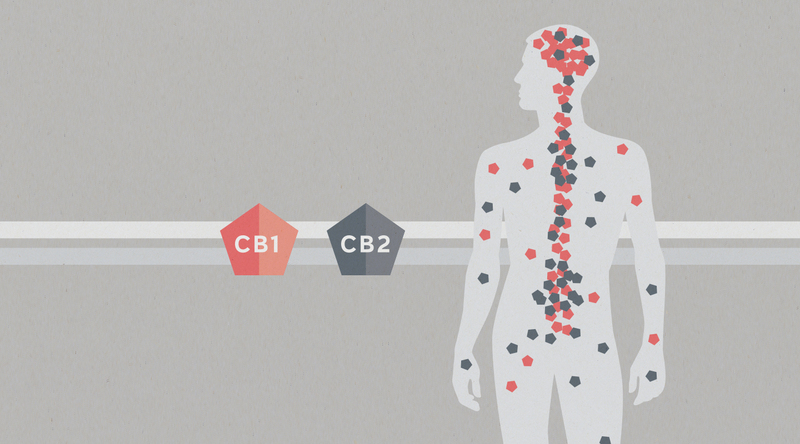 The study of the endocannabinoid system and its CB1 and CB2 receptors is only beginning. It’s our vision that with the burgeoning normalization of cannabis use, that the scientific and medical communities continue to unlock the still hidden mysteries of how this system works and how cannabis can help future generations. Disclaimer: All blog posts are Content as defined in and subject to, and all capitalized terms in this disclaimer have the meanings found in, the Emblem Website Terms and Conditions, which can be found here: Website Terms and Conditions. In accordance with the Emblem Website Terms and Conditions and without limiting or restricting application thereof in any way, the Site, including the Content, is provided for general informational purposes only, and does not constitute any representation as to the safety, efficacy, suitability, effectiveness or other features of medical cannabis or any other product in the management of any medical condition or for any purpose, and is not intended to provide, or to be a substitute for, professional medical advice. ALWAYS SEEK THE ADVICE OF A PHYSICIAN OR OTHER QUALIFIED HEALTH CARE PRACTITIONER FOR ANY QUESTIONS YOU MAY HAVE ABOUT ANY ILLNESS OR OTHER CONDITION, INCLUDING THE SUITABILITY OR EFFECTIVENESS OF ANY PARTICULAR COURSE OF TREATMENT. NEVER DISREGARD ANY PROFESSIONAL MEDICAL ADVICE BECAUSE OF ANYTHING YOU READ ON THE SITE. IF YOU THINK YOU MAY HAVE A MEDICAL EMERGENCY, CALL 911 OR A PHYSICIAN IMMEDIATELY.